Metabolism is the chemical reaction that maintains the living states of the cells and organism and is closely linked to nutrition. The calories which we consume provides a variety of substances which are vital for upkeep of the body such as repairing tissues and efficient functioning. Some people have a higher metabolic rate than others, meaning that they are able to consume more calories and their body burns these calories before the body stores them as fat. However, if you have a fast metabolism that does not mean that you should eat a high fat high sugar diet because there will still be consequences. And, it there are specific foods that actually support the metabolism so eating a varied balanced diet goes a long way to support this process. However, before I go on to discuss those I want to address the importance of slowing down. 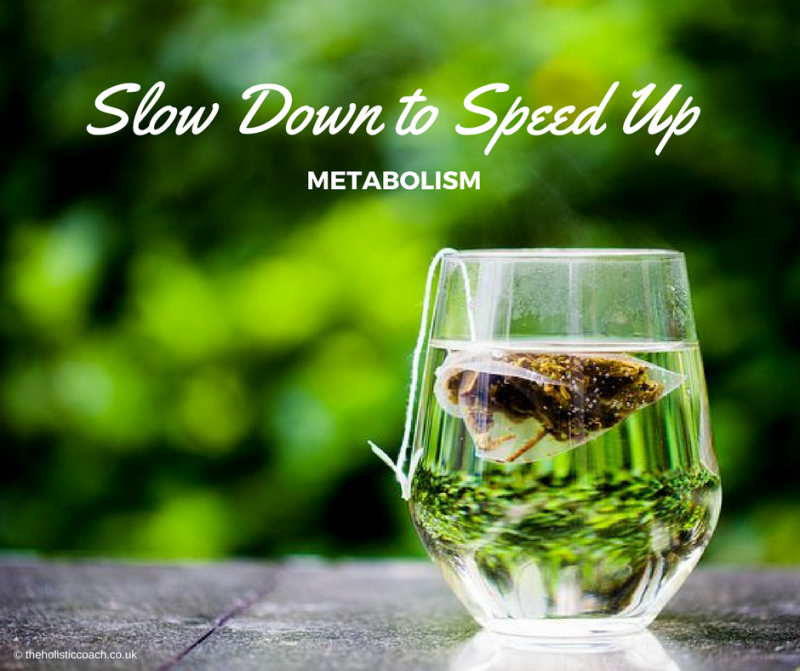 Slow digestion helps the body to give your hormones time to work at their maximum capacity. Eating any food on the go is never a good thing. The key to maintaining a fast metabolism is to eat regularly and keep the nutrients entering your body at a consistant rate, avoiding rushing. This will encourage your body to burn the calories and avoid sugar spikes that can leave you feeling wiped out and fatigued. Strawberries are a great pick me, especially when the mid-afternoon lull hits. They contain anthocyanins which helps the body to create a hormone adiponectin it is this hormone that supports your body to burn fat. Strawberries do contain fructose so don’t have too many or it may be counter productive. Green Tea has become more and more popular over the years and can help boost your metabolism because it supports fat oxidation. It does contain caffeine so should be limited but will give you that boost when needed. Beans contain fibre and the body can’t digest fibre, however, it tries! The process of trying to digest fibre increasing your metabolism and burns calories in the process. Any foods that a fibre rich will create this process. They may be little but the hot peppers give a big kick to the metabolism due capsaicin which makes you sweat! When you are sweating the calories are burning! Hot peppers aren’t a food that I would eat daily but added to your foods now and again will give you a boost. I hope this helps you to boost your metabolism.